Procrastination has actually paid off. I have been attempting to write this post for about 4 days, but luckily I put it off enough, that it happens to be going up on Cinco de Mayo. Couldn't have planned it better if I had tried. 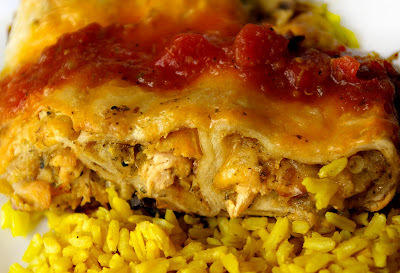 You HAVE to try these enchiladas. If you make any of the recipes I post here, make this one. Please. Just do it, you wont regret it. 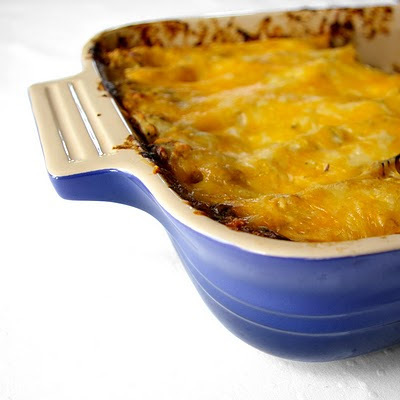 I was lucky enough to win a beautiful LeCrueset baking dish over at the Hungry Dog Blog (check her out, its a great read, with wonderful recipes) and as soon as it came in the mail, I was scheming on how quickly I could put it to use, and with what. It took about all of 6 hours before I was piling grilled chicken and veggie enchiladas into the gorgeous blue ceramic dish. 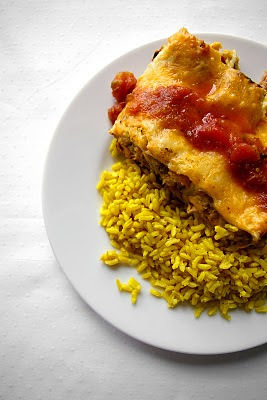 I remembered watching one of my favorite 'celebrity chefs', Tyler Florence, making his ultimate enchiladas on the food network long ago, and decided to dig out the recipe. He calls for buying a rotisserie chicken from the grocery store and shredding it, but we decided to take things a little farther. For once I can't take credit for making a recipe much more tedious and intensive than it was originally intended (see my day long lasagna-making marathon). When I asked my boyfriend what kind of enchiladas he wanted, he replied with grilled chicken and vegetables. My first thought was YUM! My second thought was crap, its a Monday night and we wont be eating until 10. Luckily, we were fairly efficient, even with the pack of tecate chilling in the fridge, and ate by about 9:00. It was so worth it though, portabello mushroom caps, sliced zucchini, red and yellow bell peppers, and split whole chickens, all grilled and stirred into the roasted tomatillo green sauce with sauteed onions. These may be the best enchiladas I have ever had, and I have eaten a fair amount of Mexican food in my lifetime. I'm talking a lot of Mexican food. Its kind of a problem actually. Prepare grill to cook over indirect heat. If using charcoal, fill a charcoal chimney with about 90 coals, and burn until covered with a light gray ash. Place a aluminum tray in the center of the bottom grate, and pile the hot coals on either side. If using gas, turn on the outer burners and leave the middle burner off. Cover, and let grill preheat for about 5 minutes. While grill is heating, prepare chicken and vegetables for grill by drizzling them with olive oil and seasoning with salt and pepper. When grill is ready, brush your grill grates with an olive-oil soaked paper towel, and place the chicken skin side down in the middle of the grill over the aluminum tray or off burner. Place the veggies over the direct flame. Check on these every few minutes, as they will char fast over direct heat (but that's the good part right?) they should only take 5-7 minutes on each side. When they are cooked through, remove from grill and set aside. Grill the chicken for 35-45 minutes until skin is well-browned and crispy. Turn chicken over and grill until breast meat reached 165 degrees, about another 15-20 minutes. Remove from grill, tent with tin foil and let rest for 10 minutes. While the chicken is grilling feel free to start the roasted tomatillo salsa. Preheat the oven to 400 degrees F. Place the tomatillos, onion, garlic, and jalapenos on a rimmed baking sheet and toss with olive oil to coat, then season liberally with salt and fresh ground pepper. Roast for 15-20 minutes, until everything is soft and starting to caramelize. Remove from oven, and place contents of baking sheet, including any juices into a food processor, along with the cilantro, cumin and lime juice, and pulse until chopped very finely and becomes a cohesive sauce. Chop grilled veggies into bite sizes pieces, and remove and shred (or chop) meat from grilled chicken. Set aside. Heat 1-2 tablespoons of olive oil in a large skillet over medium-high heat. Add the onion and cook until soft and caramelized. Add the cumin and garlic and saute for just a few minutes longer. Add the flour and stir constantly to make sure flour doesn't burn. Slowly add the chicken stock and cook over low heat, stirring until incorporated into flour/onion mixture and sauce thickens. Stir in half of the tomatillo salsa, the chicken, and chopped grilled vegetables. Season to taste with salt and pepper. Preheat oven to 375. Start the rice. In a small sauce pan, combine chicken stock, turmeric, garlic cloves, olive oil, salt and pepper and bring to a boil. Place rice in a 13X9 glass baking dish and pour the boiling liquid over the rice. Stir briefly with a fork, cover tightly with tin foil, and bake for one hour. Pour a bit of the into a 13X9 baking dish to coat the bottom. 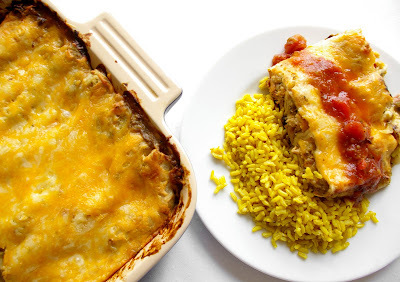 Pour the remainder onto a large plate and get ready to assemble the enchiladas. Flash one of the tortillas briefly over flame on stove to heat and soften a bit. Place into reserved tomatillo salsa on plate to coat both sides of tortilla. Spoon 1/12th of the chicken/veggie mixture (just eyeball it) and sprinkle with some cheese. Roll up gently and place in baking dish. Repeat with 11 more tortillas, or however many you can squeeze into your dish. If you have any sauce left pour over the top, and sprinkle generously with cheese. When your rice has 30 minutes left, put the enchiladas in the oven and bake for the remainder of the hour (30 more minutes) until cheese in gooey and delicious. Serve with rice and additional salsa, and if you want to get real naughty, sour cream and guacamole. These look so amazing! I check them out every couple of days as I try and work up the mindset to make them. I hope you took some pictures of all that wedding baking! I never think to grill my protein for enchiladas. But this is perfect for a deep, smoky taste. Great idea! Grilling not only the chicken but the veggies as well just took this dish to a whole new level! Thanks for stopping by my blog!